1. Mix all the ingredients for the marinade together, then add the prawns. Set aside for one hour before cooking. Don’t leave for longer than one hour, or the lime juice will start to cook the prawns. 2. Thread the prawns onto 4 skewers (if using wooden skewers soak them in water for an hour or two to make sure they don't catch fire on the barbecue). 3. Meanwhile make the garlic mayo by mixing all the ingredients together. 4. 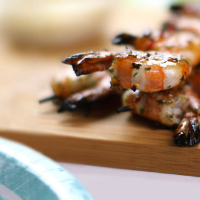 Cook the prawn skewers on the barbecue for 7–8 minutes, turning a couple of times. They’re cooked when they turn bright orange. Serve with the garlic mayo.